June | 2014 | WE BIKE, etc. We decided to leave a little later to hit the road by 8:00am, while Peter was doing the pre check on the bike – I know he is a safety guy!! He found the back brakes were not tightened down properly at the bike shop and had to fix them before we could take off – 45 minutes later we were on the road. We were planning to stop at Painted Canyon Visitor Center but due to the late start we took a bird’s eye view from Interstate 94 as we went by. It truly was beautiful and I took some video of the view. We then continued on Old Hwy 10 thru Dickinson all the way to Glen Ullin. Old Hwy 10((139) is the Scenic Byway and the sign had a buffalo on it – so we assumed we would see some buffalo- but we did not see any buffalo although the view and road were very nice and they had just repaved a huge piece of it. We got into Glen Ullin at about 6:30pm it was a long day in the saddle, and unfortunately the campground did not have any showers – so we went to bed stinky – yuck!! We again met the couple from Alaska after not seeing them since East Glacier – we exchanged our adventures over a six pack of Summer Shandy from Wisconsin Leinenkugel’s Brewery – it sure tasted good after a long hot day. We had our first storm while camping that evening but everything came thru it ok and we did not get too wet. After the storm last night we decided to get going and eat breakfast at the convenience store in town. We got on the road by 10:00am and spent the first 12 miles on Interstate 94 which was not too bad accept for the second rear flat we had to fix along the highway. About 20 miles out we blew the tire – this time it was a metal wire that went thru the tire and about a ½ inch into the tube. Peter found the wire and removed it and put in a new tube and we were on our way again. This tire change was much less eventful than our first one. In New Salem we got off the Interstate and again were traveling on the newly paved Scenic Byway (139) – very nice. We got into Bismarck with our first stop being the Laughing Sun Brewing Company. We were really looking forward to a good beer it had been a while since we were able to hit a microbrew. They had good beer and we met three young men from Rice Lake – who were biking from Rice Lake to Spokane. They were fun to talk with and were having a great trip so far. 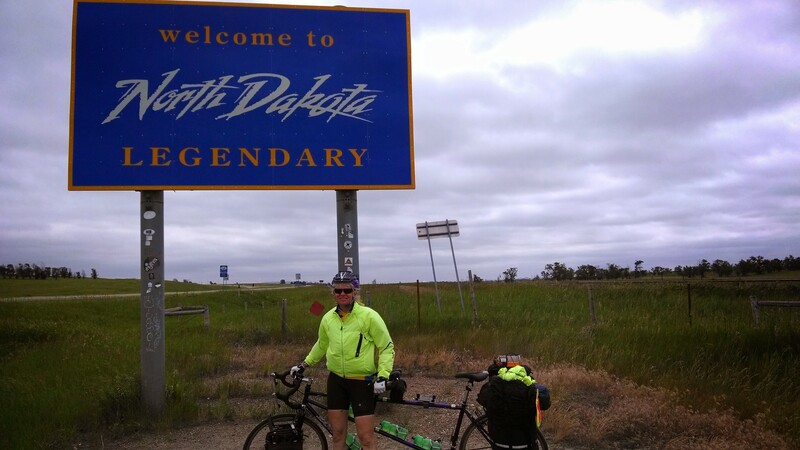 This evening we are enjoying our first Warm Showers stay in Bismarck(which is an online site where people offer to host touring cyclists – it is a great site to find a home stay)– our hosts are Joyce and Ron Gerhardt. They are especially gracious hosts and provided us with a bed, shower, laundry, dinner, breakfast and anything else we needed. Kyle, the young man we have been biking with is also here tonight – so it is fun to hang with him again. We have been having a great visit and will miss Kyle when he takes off south to meet up with his friends, he has been a good guy to travel with and we will miss him. 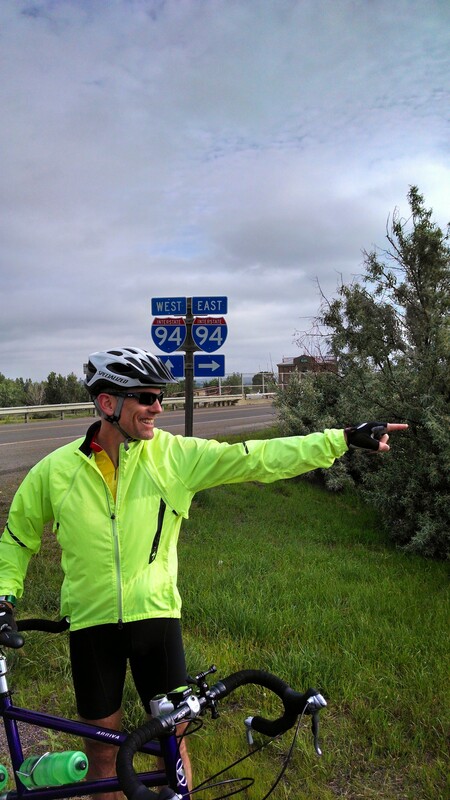 Today was a tough ride – we started early in Glendive and the route immediately put us on Interstate 94 East where we had to battle a nasty headwind which limited our mph to between 8 – 10. Riding on the interstate is not as scary as it sounds there actually is a nice big shoulder for us to ride on and the drivers are very good about changing lanes anyway when they come upon us. The truck drivers are especially good – 98% of the time they move over if they can. The other good thing about being on the interstate is the sight lines are really good and drivers can see us from a very long ways back. We biked the first 40 miles battling the headwind and traveling on 94. Upon entering North Dakota – yea!! Our route changed to Old Hwy 10 which was a great quiet road with little or no traffic. As we were heading east the headwind started to go away – which was great but then the storm came in – the skies opened up and it started to pour. We made it to within 3 miles of Medora our ending point and had to take cover under a bridge when it stated to lightening and thunder. We spent about 45 minutes under the bridge and then were able to ride the last three miles to Medora. We stopped at Dakota Cyclery for some much needed repairs to our bicycle. The staff at the shop was great and was able to help meet all our needs. So the bicycle is now clean again and ready to roll. 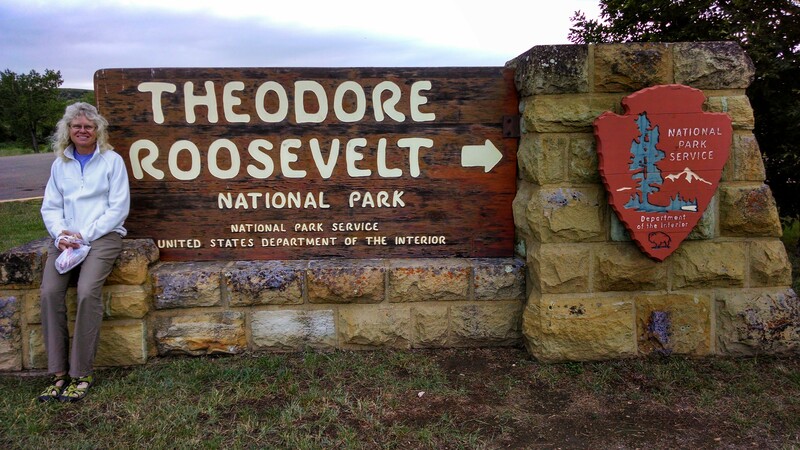 Medora is a cute little town located right next to Theodore Roosevelt National Park. It is just beautiful here – with the Badlands rock formations surrounding us. Tomorrow we hope to check out more of the area and specifically the Painted Canyon which we have heard is worth a stop. This blog will have four days of travel – sorry I am a bit behind we have been putting in lots of miles and the connectivity has been pretty limited. Also wanted to let you know – new videos have been added to the Glacier National Park- So Beautiful Blog – please take a look. Today we had a great ride to Malta – the weather was nice and the tail wind pushed us along. It was a relatively flat ride and the strong tail wind allowed us to move right along and complete a potentially long day of riding fairly fast. The majority of the ride today was on the Fort Belknap Indian Reservation – our travels thru the Indian reservations have always been met with caution due to the feedback we have received from locals and other cyclists. The comments we hear are to keep moving thru the reservation and do not stay on the reservation if you can help it. The reservations have some beautiful areas but you can surely tell how poor the native Americans are and how much they are struggling. It is not uncommon for local people to see us and ask where we are going and then warn us to be careful, you can tell it is hard for them to talk about it and they do not want to appear prejudice but at the same time they do not want us to be naïve and get into trouble. We stopped in the little town of Dodson at their convenience store (pop. 124) and spoke with the store owner, he said his business has been dying for the last several years – a combination of the fact that their are no longer small family farms( all are now 10,000 acres plus) and the oil boom has destroyed his business. He explained that he no longer has the farmers coming in every morning, for coffee and a snack and the oil boom had affected the amount of cross country cyclists coming in and also led to less people traveling his way because of all the trucking and other negative things going on because of the oil fracking. Very sad he owned the business for many years and will probably end up having to close it soon. We continued on our way to Malta and stayed at a local campground which was right – I mean right on the railroad line. When the trains came thru which they did all night at times you thought they were going thru your tent. At the campground we had the pleasure of meeting two cross country cyclist – Kyle from Portland heading to Minneapolis and Mark from Fargo heading west to the west coast. It was nice to have a chance to chat with other cyclist and get the scoop on places to stay and things to see from Mark who was heading the opposite direction. The next morning Mark headed west and Kyle, Peter and I headed towards Glasgow or Wolf Point. Kyle was for sure going to Wolf Point and Peter and I were debating on where we wanted to end – we will see what the weather and wind are like and make our decision tomorrow. Wolf Point was a 120 plus ride and Glasgow was 70 miles – but the logistics in regard to the Indian Reservations were making it a tough decision. Weather 65 -70 degrees, sunny and a nice tail wind. Ok we decide to go all the way to Wolf Point – it was our longest ride on the trip. We got to Glasgow stopped for lunch and looked at weather, length of ride to Wolf Point and how we felt about another 60 miles on the bike. We decided to go for it and took off after Kyle on the ride to Wolf Point. The route had lots of long rolling hills with great views and we pretty much put our heads down and just went for it. The tail wind was great and kept us moving along. Although the last 15 miles to Wolf Point were a bit tough with the tail wind shifting to a cross wind. All the riding from Glasgow was in the Fort Peck Indian Reservation. The only place to stay according to our sources was Wolf Point and there was one RV Park to camp in which was in the west end of town. When we got to Wolf Point we found Kyle and biked into town to get some groceries and dinner. We had several locals come up to us and ask where we were staying and told us to not stay in the city parks it was not safe and told us to stay at the RV park. Peter even talked with a BIA officer who worked narcotics on the reservation – he also warned us to stay at the RV campground and told us the owner was a great guy and a former Native American bails bondsman and he made sure nothing bad was going on at the campground. He also said that in Wolf Point you have to look for trouble but in other parts of the reservation trouble finds you. He said we would be fine. We stayed at the campground with Kyle and also another couple who showed up by car from Somerset, WI. They were driving across to Seattle and then the husband was going to be biking back to Somerset. They were nice to talk to and we were able to give them lots of advice about the route. Too funny again it is a small world – Andre Johnson from Somerset was a 5th grade science teacher for our youngest daughter’s college roommate – (Natalie). He of course knew Natalie and her family. Our stay at the campground was uneventful and the next morning we headed south off the reservation towards the Town of Circle. It has been nice to be riding with Kyle – he is a nice young man and adds a bit of comic relief and smiles to our trip. We started early in the morning for a long ride to Glendive. We are now leaving Hwy 2 and heading south on Hwy 13 towards the town of Circle. The Adventure Cycling Maps changed their route south a few years ago after the oil fracking began in Williston, ND. This was due to the oil truck traffic on Hwy 2 and bicyclists responding that they did not feel safe on the route due to the narrow road and increased traffic. The 53 miles to Circle was tough – it was windy and the route was mainly uphill. We were pooped when we got to Circle and relaxed over a long lunch with Kyle. 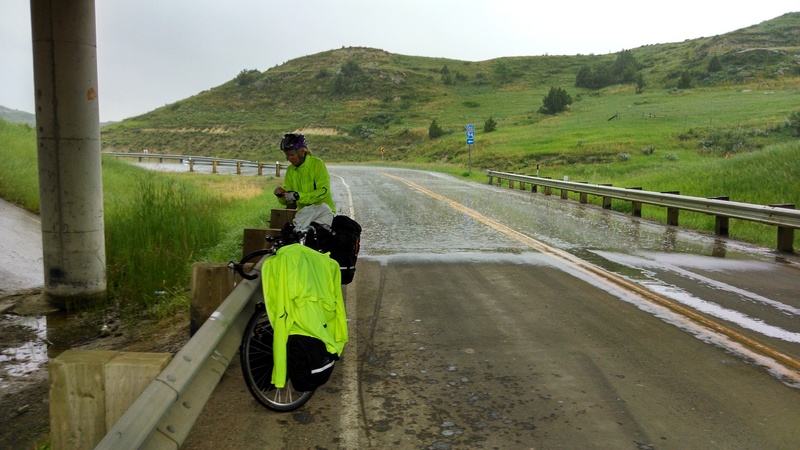 After we recouped we hopped on the bikes again and began our 55 miles to Glendive. 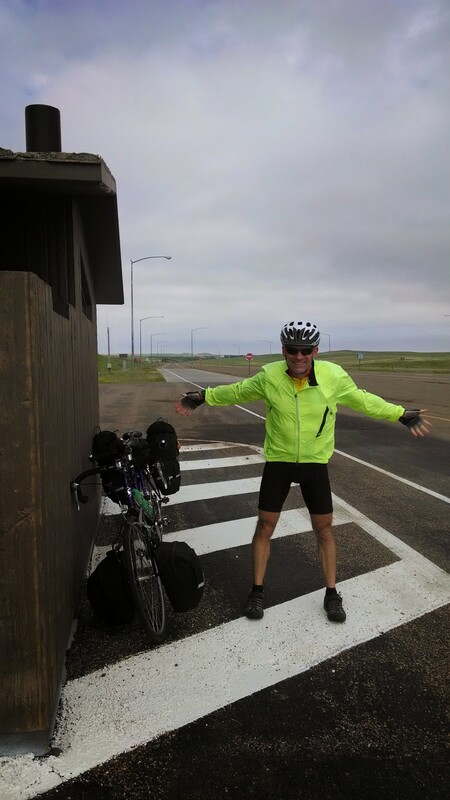 We were told by the locals that we would have an uphill climb to the continental divide – and then it was downhill for the last 30 plus miles to Glendive. We had just made it to the high point and were looking forward to the downward trip. We had begun to head downhill at approximately twenty miles per hour when the backend of the bike started to wobble a bit and then we heard a loud bang and our back tire blew – bummer. The blowout destroyed the tube, tire and took out half of our rear brake. No worries we were able to stop safely and had all the supplies to fix the tire. Peter began to fix the flat after we removed all the bike bags and removed the tire. He got the new tire on and the new tube and was using the CO2 to fill the tube. The first one leaked and did not fill the tire, the second one jammed on the valve stem and Peter had to rip the inter tube at the stem to get it off. No worries we still had two more inter tubes. So tube number two goes on and now we have to use the emergency hand pump to fill the tube – this is very difficult and impossible to get to the full pressure of 115 lb. So along comes a van on the road and the family inside asks if we need help – they had a bicycle on the back of the van so we thought they might have a floor pump. They stopped and they did – yea. Peter pumped up the tire and then after putting everything back on the bike we were ready to go again. The family was just great they took our tent for us and told us they would reserve a room for us in town because they heard there was only two rooms left at the hotel we planned to stay at. We continued on our ride which was all down hill (35 miles to Glendive) It was a easy ride with a nice tail wind. We still did not get in to town until about 6:00pm – we left Wolf Point at 8:00am so it was along day on the bike. Kyle who we had been riding with for the last couple of days was worried about us and waited for us at several places along the route. Luckily, again small world the family that saved us ran into Kyle at the grocery store in town and told him we were fine just had a back tire blow out. He was relieved. We rolled into Glendive and their was a room waiting for us – last one in town. The family that rescued us just did it again. We gave them a call when we got settled in and cleaned up, they asked us to go to dinner with them – so of course we did. They were from North Carolina and Russ the father was biking across part of the country from east to west and mom and the two girls were sagging for him. We had a great dinner with them and enjoyed getting to know them. They are truly caring people and this great family is truly one to model after – they provided us with help and companionship when we most needed it and even paid for dinner. 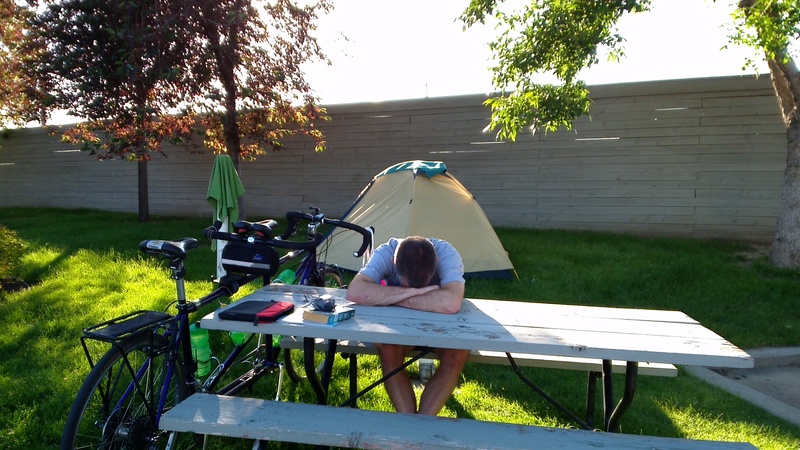 We returned to the hotel for a good nights sleep anticipating a day off the bike the next day. We spent the day in Glendive completing some necessary tasks – grocery shopping, laundry, lunch and a coffee break. We were headed to the grocery store and saw a familiar bicycle sitting by the local laundry mat – Kyle was inside doing his laundry – he stayed out at the state park last night. It was so good to see him and he was happy to see us. After a short visit we headed off to do our errands and Kyle headed to our hotel room for a much needed shower and then he was heading out to Medora his next stop about 60 miles away. We spent the rest of the day relaxing and getting ready to take off the next morning. Today we finally got some great weather and were able to really put the miles on – we biked our longest miles on this trip – 109 and finally got over 1,000 miles overall(longest we have ever gone on a multi day trip) – yea!!! This was a nice way to usher in (tomorrow) the first day of summer (longest day of the year) by hitting our two longest. Although we biked so far, the tail wind allowed us to average 20.7 miles per hour an amazing speed on a loaded tandem. It was a fun ride and the change in weather was very welcome. The landscape has changed extensively – open prairie, with rolling hills and small mountains in the distance. We continue to be amazed by the number of trains we have seen and the number of oil cars that are traveling across our country. We needed a mid ride break for lunch and decide to stop in Chester for coffee with our peanut butter sandwiches. We were in downtown Chester – very small and I saw a woman heading into the library with her children and I stopped and asked her if there was a good coffee shop in town – she turned around and said yes in the library. So Peter and I headed into a beautiful library which had a coffee shop in the back. The librarian also served as the barista and made us both a great cup of coffee. I asked her about the coffee shop and she said it had been open for about five years and they use the profits for library improvements and supplies. The coffee shop itself was built with the coffee profits and new restrooms added to the building, new lighting etc. What a great idea and she said they do a great business. They also deliver to the local companies, schools, hospital etc. I also needed a new book and they had a book sale going on, so now I am excited to start my book tonight. We have started to see Prairie Dogs – we see many running around in the grass and in their burrows near the road and several that have been not so successful crossing the road – (poor Prairie Dogs) they sure are cute little guys, but I am sure very destructive. We got into Havre with lots of time to spare and hit the local Brewery – Triple Dog Brewing Company. We actually got to the brewery early and had to wait for about an hour for them to open – that was alright because it gave us a chance to relax and catch up on the local news. The brew master arrived promptly at 4:00pm and invited us and another party in for some beer. We tried the Dumpster Diver Stout which was very good. We met a nice young couple and the husband’s father at the brewery and talked to them for a long time they were from Reno, Nevada and the father from California. They were in town for a 20th class reunion the wife grew up in Havre. We got some helpful tips and they were very kind and bought us our beers. We enjoyed visiting with them and continue to be amazed at how kind everyone we have met is. It is truly amazing. Scored one more pint glass for our collection. We are staying in a local campground this evening which is very nice – it has showers, laundry and WiFi – what else could we need. We finally were able to get going again, we got up early and were on the road by 7:00am. The weather was cold – 40 degrees with a light rain when we got started. We headed east on Hwy 2 to Browning 12 miles down the road and then on the Cut Bank which was another 34 miles away. As we rode the weather was getting better, temperature going up, lighter rain and more wind to push us along. We got to Cut Bank very quickly at an average speed of 19 miles per hour. We stopped in Cut Bank for late breakfast at the Big Sky Café recommended by a local I met at the gas station. We were talking with the waitress and she asked us where we were going and where we were from. As we talked the couple (Kay and Nick)at the table right next to us overheard that we were from Green Bay. They also were from Green Bay – in fact Nick was a firefighter on the Green Bay Fire Department for 33 years. I told him about working for the Village of Allouez and helping with the consolidation of the departments. He retired prior to the merger. Boy it sure is a small world. The waitress then told us about a visit from a bunch of Packer players to the café last summer. She said about ten of them with their girlfriends and wives showed up for lunch on their way to Glacier National Park. She did not know who they were until a patron asked if she got their autographs, he then proceeded to tell her who they were. Off on the bike again heading to Shelby – the ride was uneventful and we cruised into Shelby with a nice tail wind and a bit of rain. Shelby is being taken over by the oil fracking that is going on in the area. I met a young man from Paragon Geo Tech who is doing some testing to determine if oil is in the area – he said there definitely is and soon you will see more oil being produced here. We also saw lots of trains carrying large oil tankers. It appears to be putting lots of pressure on the area. Tomorrow we head to Havre for our longest ride of the trip, the weather is supposed to be sunny, 70 degrees and with a 15 – 18 mile per hour tail wind. We spent a second day in East Glacier, it just was too cold and rainy to bike. If the temperature was warmer with rain or colder temperature and no rain but with the two together it is just not good to be out on the bicycle. We were concerned about being able to stay warm. Had a fun day exploring East Glacier, went to the post office, grocery store, Grand Lodge and cleaned and checked over the bicycle to get ready to go tomorrow. Had lunch at the Grand Lodge today because it was raining to hard to walk the 1/2 mile back to the Hostel. I got the Huckleberry Bread Pudding for dessert which was very good – a couple from Harpers Ferry that we were talking to yesterday in the Laundromat said we needed to try it – they were right – delicious!! The Grand Lodge is beautiful and even with the rainy weather you got a great view of the mountains. It was amazing to see the amount of snow added to the mountains in this storm, they also have some additional roads closed in the park due to the recent storm. The Logan pass is still not open and I am sure the recent storm will push it back even further. Plans are to head out to Cut Bank (about 48 miles away) or if the weather is good and we are feeling good we will head to Shelby which is another 22 miles down the road. We need to get cruising and make up some miles due to our second day off the bike. We left later this morning because we were not going to bicycling as far and it was another rainy day. We also wanted to hit the bike shop to buy a couple of replacement water bottles and put a little more air in our bicycle tires. Little did we know that nothing is open Sunday mornings in Whitefish- oh well off we go. The first part of our ride was a bit rainy and cool but on a nice quiet road with little or no traffic. Nice views from the road of the river and mountains. 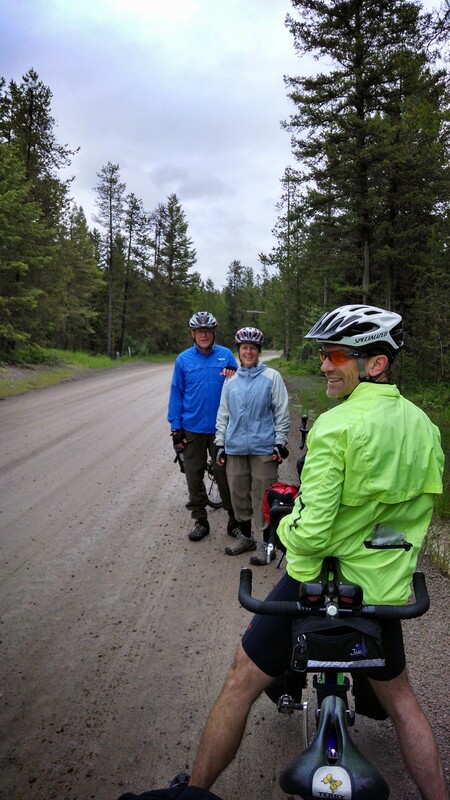 Made it to Columbia Falls about an hour later and met a nice local couple who were out for a Father’s Day ride – we talked with them and biked with them a bit then continued on our way to West Glacier. The ride to West Glacier was nice great views – we also crossed the Flathead River where we saw where all the rafting companies where picking up their customers – we watched a boat come around the bend sideways – I am not sure that is the direction they wanted to be going. After the bridge the road became gravel – but it was not too bad to ride on – it was in pretty good shape. We came around a bend in the road and there were two touring cyclists taking a break – we stopped and chatted for quite a while. 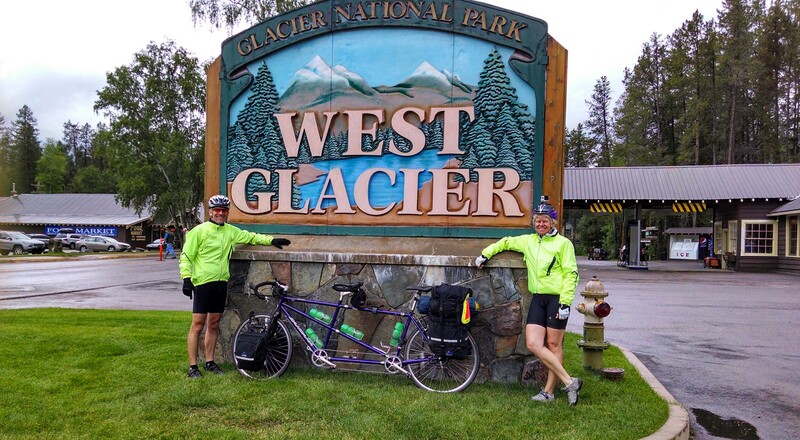 They were from Anchorage, Alaska – Pete and Deb- they are also biking to the east coast. It is funny because we heard about them the day before and were glad to finally get to meet them. They were teasing us that we are the tandem couple who just fly on the bike and they figured we would catch up with them soon. We continued on to West Glacier and got there about a half hour later. West Glacier is cool – we stopped for lunch at a local café and had our first and hopefully not last – Huckleberry Float. One of our blog followers told us to make sure we got one and boy was it delicious. I am hoping we can find them at other places near Glacier. Unfortunately the Going to the Sun Road is still closed – they have to clear all the snow away and figure it will not be cleared and open until June 21st. So we will take the alternate route which should be just as beautiful just not as high of a climb. So we headed out of West Glacier on Hwy 2 – it is a very narrow road and lots of cars especially near West Glacier. We were glad to get further out where there at least were not so many vehicles. Made the final not too big of a climb to Essex and are staying at the Glacier Haven RV and Campground. The weather cleared up and we are able to camp. The campground is very well kept and has the cleanest restroom and showers I have ever seen. The owners are great and their brother in law visiting from Seattle bought us a couple of beers when he heard me ask the owner if I could buy any from him. They do not sell beer at the campground. The couple from Alaska are staying here tonight also and we had a chance to talk and get to know them. It should be a cold night I think it is dropping to 40 tonight – Peter and I will have to snuggle to keep warm!! Today we left the campground a little later since we were only bicycling 36 miles to East Glacier. The shorter ride had to do with the location of places to stop and the mountain ranges – it was either go 80 miles with a mountain pass or shorter with a mountain pass. We decided on the shorter with the pass. 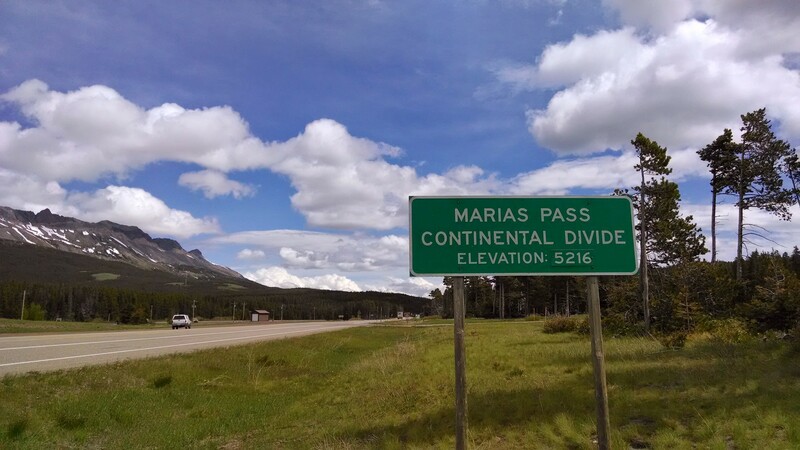 We went over Marias Pass today – (5,236 ft elevation) the climb was not bad –it was a very gradual steady climb to the top. We climbed the mountain pretty well today a 26 mile climb completed in 2 hours not bad. The downhill was nice – very steady gradual downhill into East Glacier. Saw some beautiful waterfalls and mountain views. All around good ride. Tonight we are staying in the Brownies Hostel in East Glacier – great place to stay and have met lots of nice people. 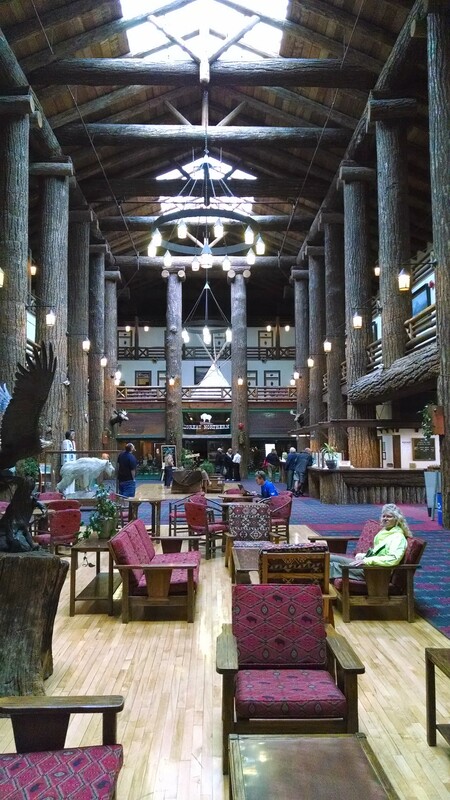 We also walked down to the Glacier Lodge in Glacier National Park – it is a beautiful lodge originally built in 1913. We wondered around the Lodge and then ran into the couple from Alaska – who are staying at the Lodge, we joined them for a drink in the bar. 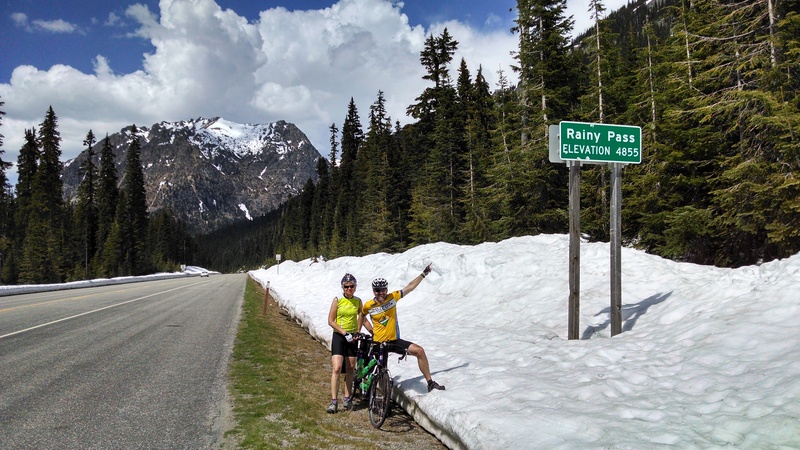 We may take our day off the bike tomorrow and stay one more day in East Glacier – the weather is supposed to be terrible tomorrow – 40 degrees and hard rain!! Yuck. Today was our first day back on the bike after taking the last three days off for Peter to teach. The ride was mainly on Hwy 95 and 200. Highway 95 was not too bad to bicycle on it had a nice wide shoulder and the motor vehicle drivers were really good about moving over. We then biked across the long bridge into Sandpoint, ID. It was a fairly nice separated facility adjacent to Hwy 95 that only bicycles and pedestrians could use. It appeared to be the original bridge crossing Pend Orielle Lake. It was nice to be separated from the motor vehicles on the long lake crossing. We stopped in Sandpoint for lunch and to shop a bit. It is a cool town with lots of nice places to eat and shop. We ate at the local brewery – McDuff’s the food and beer were both good. Then back on the bike for the last twenty miles to our campground in East Hope. We were on Hwy 200 for the rest of our ride to the campground. It was not the best road to ride on, narrow and very little shoulder, but at least the drivers were good about going around us. The whole ride was fairly flat with a few small climbs. We stopped in Hope at the little store, bakery, ice cream shop. We each had ice cream and enjoyed the great view. Our overnight is at a beautiful National Forest Campground located on Pend Orielle Lake. This is our first night of camping on our own in our tent and it is talking a bit of time to get used to it and where everything is and where everything goes. I am sure we will get better and better at it as the days go by. Was a long hard ride to Libby – second day carrying all gear. Route was hilly and we had to fight the wind most of the day. Tracy pooped out with about 10 miles to go – luckily there was a tourist attraction – beautiful falls and suspension bridge that we were able to stop at and take a break. Peter checked out the falls and bridge, Tracy relaxed and refilled her tank. It is amazing what a coke and candy bar will do for you. Today we crossed into Montana and were greeted with a 3 mile gravel road and a very basic welcome to Montana sign. We stopped to take a picture of the sign and Tracy pulled the map out of her pocket and left it sit on top of there bike bags, of course it fell off. Tracy realized she lost the map about a mile down the gravel road – so we had to go back on the gravel road to find it luckily we found it laying in the street. We then stopped for a snack at a restaurant and had the very nice owner fill up two of our water bottles which Peter proceeded to leave on the bar. We did not notice they were gone until we were about 5 miles away – we were not going to return for them!! The rest of the ride was uneventful and we got into to Libby at about 5:00pm and found a nice campground with showers – yea. We were supposed to get rain tonight but it held off and we stayed dry. We were up and on the bike by 8:00am with a quick stop in town for a coffee and tea. Shortly after leaving Libby the rain started and it was with us for the first 30 miles of our ride. Temperature was in the upper 50 and with the rain it was definitely a cold ride. But we just kept moving and it did not seem too bad. We stopped at a restaurant for an early lunch and were able to spread out our wet clothes and have a good lunch and something hot to drink. We were the only ones in the restaurant and the woman running it was really cool and allowed us to spread our wet gear out. After lunch we hopped back on the bike for the next 45 miles – thank goodness the rain had stopped but it still was a cool and cloudy day, although towards the end of the ride the sun did come out. The ride was a great one along Hwy 37 most of the way – which was located next to a beautiful huge lake – Lake Koocanusa. The lake was 50 miles long. There was one bridge across the lake which was located about 20 miles from Eureka – it was the straightest bridge I have ever scene and very high in the air. The ride had lots of uphill climbs and some long rolling descents – it was a fun ride but tiring after a whole day of it. Decided to stay at the Silverado Hotel in Eureka after a day of getting soaked and needing a nice hot shower. Started the day at about 9:00am in Eureka to a steady rain. Rode the first 15 miles on Old Highway -Tobacco Road. It was a really nice scenic ride on a lightly traveled road. We saw lots of cool things along our ride. Tracy took a lot of video on the road but unfortunately the memory card was not in the camera so you do not get to see any of it. So here is what you will not see – cows wandering on the road(many), four really cool old cars that drove past – including a vintage Rolls Royce and Ford Mustang, beautiful adjacent stream and cloud covered mountain views etc. After Tobacco Road we traveled most of the rest of the ride on Hwy 93. The road was not too bad but with the rain and wind and fast cars going by it was not the most enjoyable part of the ride. We were totally soaked by the end of our ride. We stopped about half way at a really cute diner – On The Fly Café – it was an extremely small café only two tables but it had great patrons and a very nice owner who served great food with an amazing sense of hospitality, it was like be a guest in her home. We got lots of tips from her and the other patrons – unfortunately they could not help with stopping the rain!! We got in to Whitefish at about 3:00pm and decided on a hotel again to get out of the rain and get warmed up. We are hoping the rain will not be so bad tomorrow and we will be able to camp again. We walked into town and hit the local Brewery – Great Northern Brewing Company and then dinner at the Buffalo Café. The burgers were very good and definitely hit the spot after a long cold bike ride. Well tomorrow is a special day and we want to wish all fathers a very happy Father’s Day. Especially our fathers who we are not able to spend the day with- we love you both and will be thinking about you. Also want to wish Rod MacKenzie a special day and thanks for taking such good care of us during the first week of our trip!! More to come – hopefully more pictures and videos!! Today we got up early because we knew we had a long ride ahead. Left campground by 7:00am. First part of ride was over some small mountains just outside of Colville. They were not bad to climb but the downhill was pretty intense with a couple of hairpin turns. We climbed for about 18 miles and then had a 10 mile downhill. We met a couple of young men from Washington who are also biking across the country. John is attending Western Washington State University and Grant is a recent graduate from Duke University. Grant has a job staring in September and talked John, after a few beers, into bicycling across the country with him. They had just started out and were excited about the trip. They will be ending in Washington DC. Grant figured he would probably have to wait a long time to actually get 10 weeks off so decided to do it now – very smart young man!! After the downhill we biked a mile off route to the small town on Ione where we met our sag crew (Ruth and Rod for lunch). The rest of the trip was biking along the Pend Oreille River, it was a beautiful ride – with the wind at our backs, downhill and great views of the river to our right. We decided to not plan our ending point today because we were not sure if we were up for 96 miles to Newport but with the wind and downhill we pretty easily made it to Newport. We saw our first American Bison (buffalo) today and Peter was giving Tracy a hard time because a couple of days before Tracy thought she saw buffalo but they were only Large Cows. This time they were the real things. Today was a short ride for us which we planned for after our long ride yesterday. The shorter day allowed us to leave later – Tracy liked the 10:00am start better than the 7:00am starts. The ride took us into the state of Idaho – although we actually camped in Idaho last night – it was rather odd our campground was half in Washington and half in Idaho. 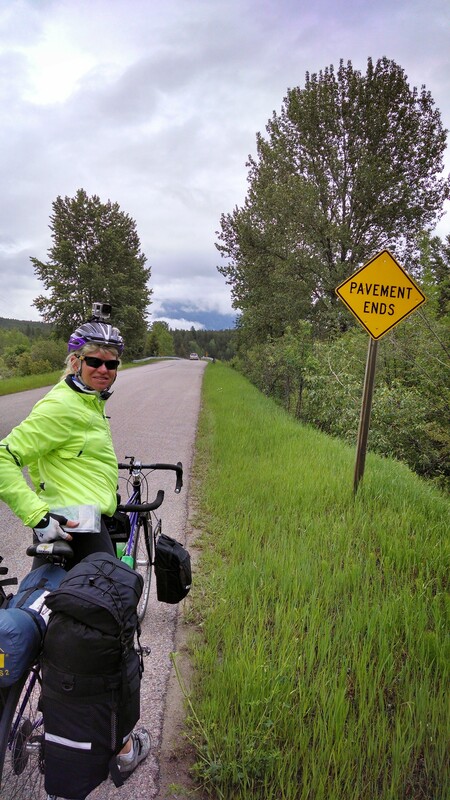 We biked down Hwy 41 to Coeur d’ Alene, along the route we met a couple of touring cyclists from WA. 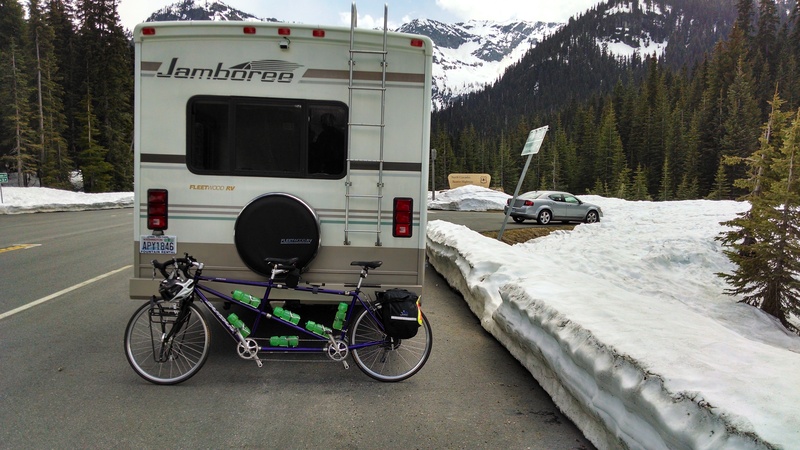 They were completing an 8 day bicycle tour in Idaho and Washington. We rode with them for quite a while – one gentleman was retired and the other a doctor. Along the route we stopped at a local park with our new friends for a snack – there was a boys baseball tournament going on- lots of little guys playing ball. They were intrigued by our ride and we got a few questions from the boys and the parents. The last 10 miles to camp were uneventful and the ride pretty much flat. We will now be spending three days in Coeur d’ Alene where Peter will be teaching an Enforcement for Pedestrian and Bicycle Safety class to local law enforcement officers. Tracy will relax and get organized for heading out on our own with out our sag support. Special thanks to Ruth and Rod for all their help the last week much appreciated!! So no blogs for a bit until we get going again on Wednesday, June 11th. We will be putting up posts for our last five days of cycling -sorry it took a while but computer hook up was a problem: So here you go, our first five days of cycling – Enjoy!! Beautiful day 67 degrees with a tail wind. Left Bellingham at 7:30am and rode down to Marine Park to put our rear tire into Bellingham Bay (Pacific Ocean) and began our journey on the Chuckanut Drive – a beautiful road adjacent to Bellingham Bay with great views. Met up with the first cross country cyclist about 20 miles into our ride – he was heading to Boston and was from Scotland. We rode together for awhile and then crossed paths again later. Continued on our journey and enjoyed the beautiful views and the flat terrain with a tail wind. Met up with a second group of cross country cyclists from Indians (2 women and a gentleman). They were going as far as Fargo North Dakota – I don’t know why you would stop at Fargo but, to each their own. Tracy said this was the toughest thing she had ever done- she woke up not feeling well and continued to feel worse all day – she was having trouble eating or drinking anything which did not help give her the power she needed to go over the pass. We spent a total of seven hours on the bike with 5 hours of climbing. It was a definite character building ride!!! The route was difficult but definitely gorgeous. We had two young ladies who are biking across the US in our campground the night before – they took off about an hour before us and we actually caught up with them about two hours into our ride. They were struggling more than us, hopefully they made it to their ending point. After climbing for five hours we went over the other side and dropped like a stone into Winthrop. I don’t think we pedaled for 20 miles, it was great and the views were spectacular. It was a wonderful end to a tough day. Today we biked over the Loup Loup Pass- (4,020ft). It was an easier pass but was a fairly steep one with 12 miles straight up to the top. We met up with the two girls again (they are from Chicago and just graduated from Baltimore University and decided to bike across the US – Vivien and Abbie) from day two at the campground that night. They obviously made it over the big mountains and over Loup Loup as well. We all agreed it was a very tough ride up to Rainey and Washington passes and we hope the others won’t be so tough. Were glad to have a shorter day today after the day before – Tracy was feeling better but still a bit under the weather. We got going early today 7:00am because of the anticipated climb to Wauconda Pass(4310ft) First stop was in Riverside about 10 miles into our ride – we stopped at the local coffee shop/convenience store where all the locals met to drink coffee – very nice people we stayed and chatted for quite a while. We continued towards Stone Mountain which was a smaller mountain – only 2,000 Ft easy ride over. We then headed to Tonasket pretty much down hill. Very different views here older mountains and flatter, also different vegetation – more pines – but still beautiful. From Tonasket we started our climb to the pass – it was a much easier climb less steep and some flatter sections – still had 24 miles of uphill today. Got to the top of the pass and the one store available was closed. Thank goodness our sag vehicle (Peter’s mom Ruth Flucke and partner Rod MacKenzie our going over the mountains with us with an RV – it has been great to have them along and they have been taking great care of us.) We were able to get some more water, snack and take a break. The ride down the mountain was again very fun and we made it into Republic the last 19 miles in just over an hour- the downhill almost make up for the tough climbs!! Got into to Republic and found a great micro brewery – had a couple of beers at the Republic Brewery – very good Stout and Porter – then rode the rest of the way to our campground – 3 miles away. We rode on our first bicycle trail of the trip from town to the campground – very nice old logging railroad route. Tomorrow we tackle the highest climb over Sherman Pass – hopefully it will go well although I think our climbing legs are getting stronger!! Today was the climb over the last big pass – Sherman Pass( 5,575 Ft) We climbed the 18 miles over the pass at an average speed of 8 miles per hour. Got to the top by 10:00am and stopped to eat early lunch and wait for our sag vehicle to put on more clothes for the cold downhill ride. As we were waiting an RV pulled up – not ours and a family from Alaska got out – we talked with them for quite a while and discovered the woman(Judy) was invoked in the Delta Junction Trails Association and they were looking at doing a bicycle and pedestrian plan. 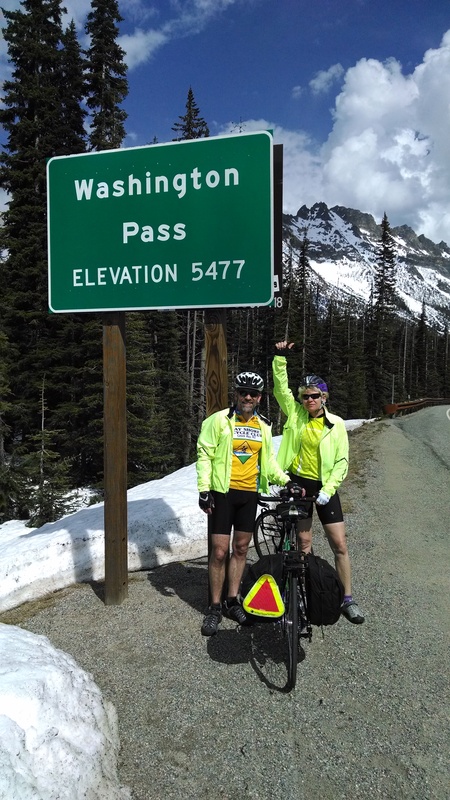 What are the odds that a potential client from Alaska for We Bike should show up at the top of a mountain pass. They were on a three week vacation and were heading home – very nice family. Shortly later our sag wagon showed up with warm clothes, water and food. (thanks mom and Rod!!) Then we headed down the other side of the mountain – which had a 6 percent slope for 6 miles – we hit 45 miles per hour on our way down – very fun and beautiful. We were traveling on a road directly adjacent to the stream coming down the mountain to the Columbia River. 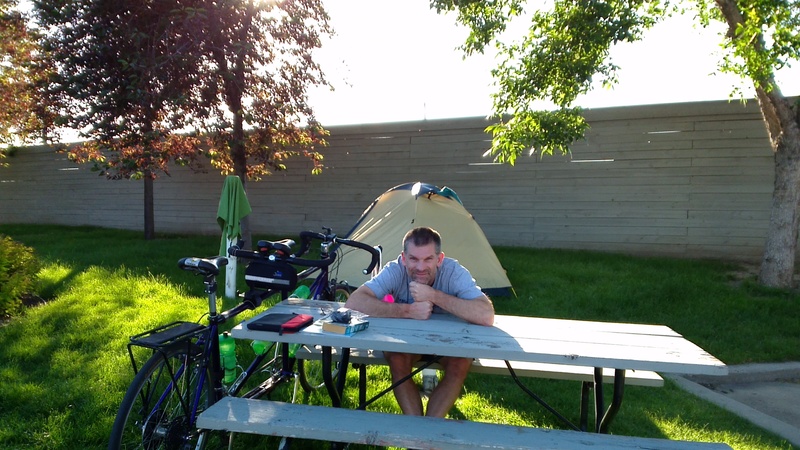 Spent the night at the Stevens county fair grounds, lots of other campers. We met people from all over – including a gentleman who was really into bicycles – Peter had a good conversation with him. We have one more day in Washington state – the roads have been great and well maintained. The drivers here are incredibility courteous. Bicyclists are part of traffic and are seen and respected – nice for a change!! We are hoping for more consistent internet connections in the future – in the mean time feel free to follow us daily on Facebook at WE BIKE, etc. We will also be trying to put up more pictures and video.